Individual dishes are brought out over the course of the brunch. Tea is served throughout ! Really lovely meal, I particularly enjoyed the dhaba chicken! So much variety, and all delicious! The chefs were also very friendly and explained to us about each dish. Beautiful and fragrant food that felt wholesome and healthy. Upma and Arti were brilliant and explained every dish and the traditions behind it. Everything tasted amazing! My highlight was the Chickpea chat. The whole experience from last night was a pleasure, having a dinner party for 8 people can always be tough but Upma & Arti were fantastic from start to finish. Arriving home to find two chefs cooking in the kitchen is always a good start but the friendly manner in which they chatted, explained each dish and the history behind it and themselves was great. We (the guests) managed to catch up, discuss the food and our lives with little breaks to hear insightful stories about what we were going to eat next. Everyone left in great spirits and praising the food/experience we had just enjoyed. 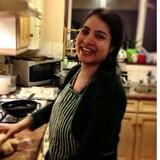 Upma and Arti offered a fantastic experience by being both highly professional and very friendly. They clearly have a passion for sharing their love and skill for food with others. The menu they prepared for us was varied, exciting and well-balanced. I would gladly have them cook for guests again. Home-cooked Indian - authentic flavours with several items having a modern and fusion twist. Everything is made in-store including chutneys. Slow roasted mince lamb with peas: This is a North Indian street food. We serve it with either rice or buttered square buns. Best enjoyed with our home-made dry mango chutney. Stuffed paneer flatbreads / parathas - Indian cottage cheese stuffed into handrolled parathas, toasted on the tava (Indian pan) and enjoyed steaming with cooling cumin tempered yogurt. Whole cumin is a must for Indian cooking. The smell and sounds when it crackles are the best bits. Cardamom is a favourite to temper teas & desserts. It has such a distinct and warming taste. Paneer is also a personal favourite - it can be had on its own, with rice, with bread and is a seriously competition to meat ! I think its amazing to be able to give your personal services for a very specific event. I love to understand what my clients want and how best I can put my personal style into use to make their parties a great success. I also love food and it relaxes me, so its great to be able to take that stress away from others - perfect sharing economy! I run High Chai events - Indian High tea with freshly brewed chais, finger sandwiches, hot bites (including the famous samosa made with hand rolled dough - no filo pastry!) and sweet bites. People love the different experience and find it a very satisfying event. I also tell stories related to each course that our linked to my childhood making every course special and intimate. If you believe this content violates or infringes your rights, Upma & Arti may not know. You could solve this problem by contacting him.